Hola! Wow, it's been a long time since I posted here, isn't it? Well, I thought my busy bee side was at it's crazy best only during XIC days. Little did I know that office life is going to be completely different and I am learning to deal with surprises almost every day. But, my passion for things I love can never die and my blog is definitely one of them. A big thank you to all the readers who keep sending in emails and messages to tell me that they miss the Dancebee's posts. It's your support and encouragement that keeps me going. So, I promise you guys that I - The busy bee aka Dancebee - will always come back home and update the blog. No matter what! And now, moving on to the post. 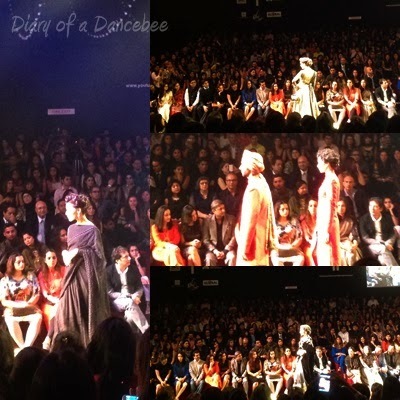 I took some time out to attend the Lakme Fashion Week winter / festive 2013 in August. While Sabyasachi's grand finale was hands down the best showcase, a few other designers like Amit Aggarwal also impressed with their innovative ideas and designs. Actress Karisma Kapoor dazzled as the show stopper for Vikram Phadnis, while Priyanka Chopra was spotted blowing kisses in the air for Reliance trends Bisou Bisou. So, let's take a look at LFW through my iPad lens (Yes! Because I couldn't carry my DSLR). Lots of love from The Dancebee.